Cryptocurrency boom: A fading fad or real innovation? The ¥58 billion digital token heist at Tokyo-based exchange Coincheck last month reminded many of the infamous Mt. Gox fiasco in 2014 and renewed debate on a critical question: Is the cryptocurrency boom a fad or a prelude to real innovation? The underlying technology of cryptocurrencies — most notably bitcoin — is often touted as something that could drastically alter the landscape of the financial sector. But Japan-based experts interviewed by The Japan Times say virtual currencies are too volatile and have several technological hurdles to overcome before universal adoption becomes possible. “It is doubtful that bitcoin or other digital currencies with high volatility will be used as a payment or money transfer method,” said Daisuke Yasaku, a researcher at Daiwa Institute of Research. But technological evolution will continue, and digital currencies will become a plausible option in some sectors as big companies and banks prepare to develop their own currencies for use in their business circles, experts said. “We’ll be seeing many kinds of virtual tokens that can be used for various ecosystems other than the fiat currencies in the future,” said Junichi Kanda, an executive at Tokyo-based financial technologies firm Money Forward Inc. and an expert on cryptocurrency. Since bitcoin debuted in 2009, its underlying technology, the blockchain, has been heralded as an innovation. It works on a peer-to-peer network that directly links people’s computers without going through huge, expensive servers. The blockchain is a public ledger that records each transaction from the beginning. The data can be mutually and simultaneously monitored by individuals called “miners,” which makes falsification effectively impossible without the involvement of a central administrator. The blockchain system is also cheaper to operate than its conventional counterparts, fueling hopes that virtual currencies can anchor a new financial infrastructure. The cryptocurrency trend has also made waves in the field of fundraising, where a firm wishing to draw investment discloses its business plan online and issues its own digital tokens through a so-called initial coin offering. If investors think the business is promising, they exchange their bitcoins or other currencies for the company’s tokens in the expectation that their value may rise. While the practice has yet to take off in Japan due to the emergence of regulation, it has become popular overseas because companies can raise money without relying on venture capital or going public. The heated enthusiasm for virtual currencies has led to an apparent bubble. Indeed, bitcoin’s price movements have been wild and unpredictable. A year ago, the price was floating between ¥120,000 and ¥140,000. It kept increasing and finally shot up to over ¥2 million in December — only to plummet to about half that in January. Yasaku of Daiwa Institute of Research said virtual tokens with such strong volatility can only be used as a niche form of payment. He also pointed out that there are technological issues that limit the potential of bitcoin. For instance, the bitcoin system can handle only 500,000 payment transactions daily. This limit, and the skyrocketing number of speculators, have slowed bitcoin’s transaction speed and considerably pushed up conversion fees at cryptocurrency exchanges. Other currencies, called alternative coin, can be sent faster and cheaper than bitcoin. These include ether and ripple. 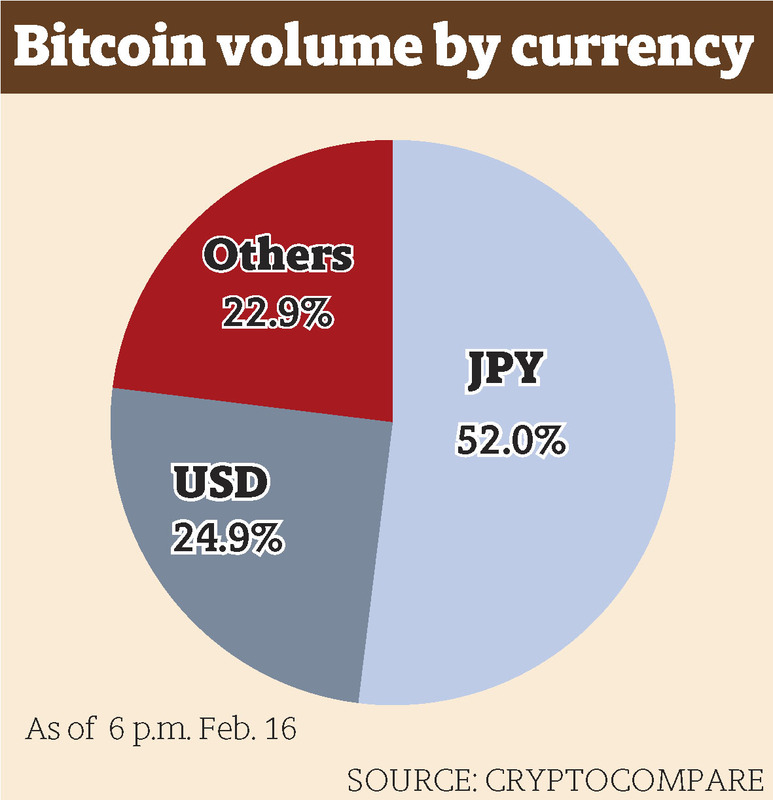 Yasaku said technological improvement could lead to the wider use of digital currencies. In fact, that potential is apparently drawing companies and banks into the fray who are interested in devising tokens with less volatility. Big names including Line Corp. have already shown interest in cryptocurrency, and the domestic banking industry is moving to utilize the practical power of blockchain technology. “There is a growing sense of crisis among banks in Japan after two to three decades with a declining economy. The banks are looking to use blockchain to reduce costs and create new business,” said Emi Yoshikawa, director of joint venture partnerships at Ripple, which made ripple. The San Francisco-based firm helped create the Japan Bank Consortium, a group of 61 banks representing over 80 percent of the country’s banking assets. With the help of Ripple, the consortium aims to find commercial uses for blockchain technology, such as platforms for making cross-border or individual payments through smartphone apps, Yoshikawa said. Cryptoprofits are taxable — have you filed? No one knows how the virtual-currency boom will evolve. Yet as a more immediate concern, the cryptocurrency industry is closely watching how the attack on Coincheck Inc. will affect its fortunes in Japan. The theft was committed despite government regulations imposed less than a year ago based on the lessons learned from the hacking of Mt. Gox, which lost ¥48 billion in bitcoin. The law now stipulates that virtual currencies have “asset-like values” that can be used to make payments and can be transferred digitally. It also obliges exchange operators to register with the government, submit annual reports and confirm the identities of people who open accounts with them to prevent cryptocurrencies from being used for money laundering and terrorism. “I think the requirements to become a registered cryptocurrency exchange will be stricter” after the Coincheck probe, said Pina Hirano, who heads the Tokyo-based Blockchain Collaborative Consortium. Hirano said the Financial Services Agency will probably start conducting inspections to check the operations and security of cryptocurrency exchanges, in addition to re-examining their paperwork. Coincheck’s registration application was pending when it was hacked, but the FSA had allowed it to operate on a tentative basis. Yasaku expects the government to look for new measures to impose to protect customers’ assets. He pointed out that if a bank customer loses money without being at fault, compensation is required by law, though no such legal protection exists for cryptocurrency assets. In the Coincheck hack, as much as ¥58 billion worth of virtual currency called NEM was stolen. Tighter regulations on cryptocurrencies would surely cause additional work and expenses for their exchanges, but it would not be all negative, Yasaku said. “Looking at mid- to long-term impact on the market, it could be positive if the rules become more solid to realize safer trading,” he said. 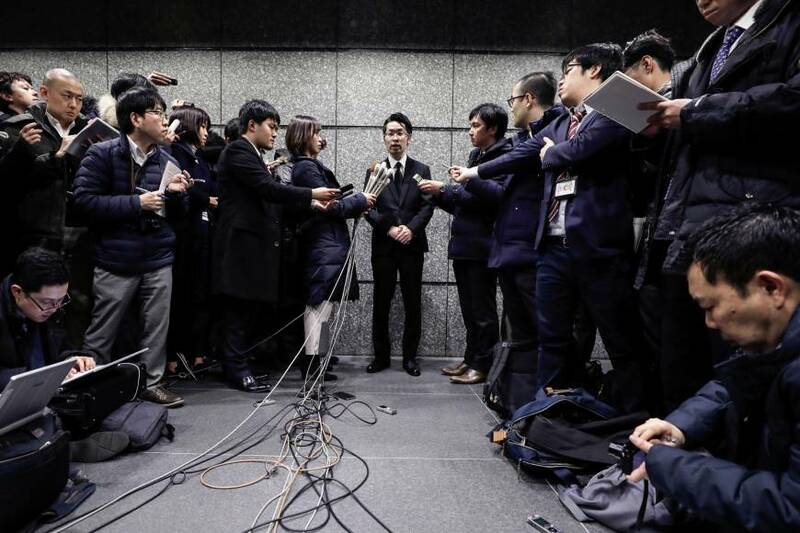 Although the Coincheck hack sparked debate on regulation, one of the reasons Japan recently became a major cryptocurrency market is its legal framework, experts said. According to cryptocompare.com, a website that tracks trade in virtual currencies, bitcoin’s daily trading volume in yen terms roughly accounted for between 40 percent to 50 percent of all trade involving bitcoin in the past two weeks. The number of clients at bitFlyer Inc., Japan’s biggest virtual-currency exchange, climbed to more than a million recently from 600,000 in May. Kanda said another factor affecting growth in the Japanese market is the fact that foreign exchange trading is already big here. “FX traders and FX exchanges have joined the cryptocurrency world and contributed to the trend,” said Kanda, adding that virtual-token trading has similarities with standard currency trading, including leverage and margin trading. It is also said that many investors found it easier to trade on the Japanese market because countries such as China have been cracking down on virtual-currency trading. The boom has attracted many investors in Japan, but the experience has been a roller coaster ride. A woman in her 30s who is a freelance public relations worker started investing in virtual currencies in January last year because contacts told her that blockchain would be a hot trend. The woman, who wishes to remain anonymous, said she opened an account at Coincheck and started out buying bitcoins and ripple coins worth ¥100,000. She checked her account several days later and found that her assets had already appreciated to ¥120,000. Since then, she has opened accounts at multiple exchanges and invested in more than 30 kinds of currencies. She also said that one fun aspect of virtual currency investment is that she has met other investors she became acquainted with via social media. Some of the meetings even led to job opportunities, she said. “I don’t think this kind of thing would happen with other investment options,” she said. But she also disclosed that her main account was at Coincheck, and that “quite a lot of assets” had been at the exchange. “I don’t know what to feel at this point,” she said, because whether she would be able to recover her money or not was unclear at the time of the interview. 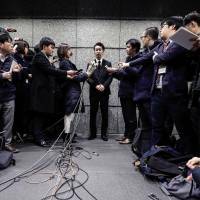 Coincheck said it will reimburse clients for any stolen assets but has not revealed when. Despite the heist, the woman said she will continue investing in cryptocurrencies because she believes they are based on a promising technology that will be more commonly used in the future. Other investors opted to take a break from virtual trading due to its volatile nature. A 28-year-old man who also wished to remain anonymous said he began investing in cryptocurrencies in January 2017. “The prices were going up and down quickly and I didn’t know when to buy and sell, so I lost some money at first,” he said. But he eventually purchased more than 10 kinds of digital currencies and got the hang of it, saying he earned more than ¥3 million from his initial ¥1 million investment. However, after bitcoin hit ¥2 million in December before sinking, he got cold feet. “I got nervous and sold most of it,” he said. Staff writer Cory Baird contributed to this report. Every month Deep Dive takes an in-depth look at a topical issue in Japan.